通用磨损性能测试仪（StollQuartermaster），可检测各类织物包括服装、鞋及产业纺织品的磨损性能及耐磨性。本仪器配有平磨测试头（充气膜式耐摩测试法）和曲磨测试头，以及所需的砝码及砂纸。内置计时器及机械循环计数器。General abrasion performance tester (StollQuartermaster), and it can detect all kinds of fabric including clothing, shoes and industrial textiles wear properties and wear resistance. 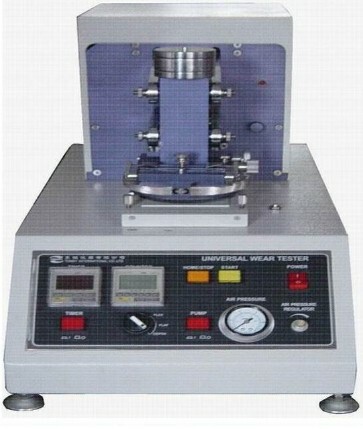 The instrument is equipped with PingMo test head (inflatable membrane type test) and the resistance curve grinding test head, and the required farmar and sand paper. Built-in timer and mechanical circulation counter.